You are here: Home / Ethnic Groups / The People of Sulawesi / Who are the Tolaki? 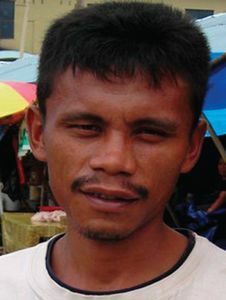 The Tolaki live in several districts in the southeast province of Sulawesi. They make up one of the largest people groups in Southeast Sulawesi. The Tolaki language is part of a language group called the Western Bungku-Tolaki subfamily. Tolaki is closely related to the Waru, Rahambuu and Kodeoha languages. Tolaki has two principal dialects, and several smaller dialects. In the developing city of Kendari, the identity of the Tolaki people group as the “man of the house” (the ones in charge) is still felt. The Lulo dance, which is a traditional Tolaki dance, highlights the unity and brotherhood which is easily felt in wedding celebrations or official ceremonies of area government. The Tolaki highly value peace and conflict avoidance, which is illustrated in a rattan woven necklace called a kalosara. The kalosara, along with the gong and the rice plant (symbols of wealth) have become icons for the city of Kendari and are seen throughout the region. Generally speaking, the Tolaki are Muslim, but traditional animistic beliefs are very much alive. They still perform several religious ceremonies that reflect this, including the monohu khau (cutting of the rice) ceremony. Tolaki believers have redeemed this ceremony as a way to publicly give thanks to God for a good harvest. Another ceremony, manahu udhan, is done in an open field for 3 nights in a row. It is led by a dukun (shaman) or a mbusehe (shaman). It is usually done in September, a night before and a night after the full moon. The only thing used to illuminate the proceedings is the light of the full moon. Then the attendees, usually Tolaki farmers, dance arm-in-arm around a makeshift structure that holds the drums and other musical instruments (a nilavaka). Early in the morning on the last day the shaman performs a ceremonial sacrifice. The Tolaki who live in urban areas have an adequate standard of living. However, those living in villages are isolated due to insufficient public transportation. Improved transportation infrastructure would help with the flow of goods and services into the remote villages and improve their standard of living. It would also make it easier for people to take the good news into their remote areas.